This morning the first hints of fall wafted into Suburbia on a cool breeze that hasn’t shown it’s face around here for months. And after several days of gray skies and intermittent showers, today brought an absolutely gorgeous bright blue sky complete with a few perfect, wispy white clouds. In the usual morning hurry, I almost forgot that today was September 11th. Those bright blue skies should have immediately reminded me. It was a beautiful autumn day in New York on September 11, 2001, when the planes crashed into the World Trade Center. Those horrific scenes are etched into my mind, all backed by bright, clear blue skies. My friend over at The Testosterone Zone asked readers to respond to her post asking where we were on that day and how the events had affected our lives. If anything, I believe that the events of 9/11 have made me more likely to appreciate the people in my life and to not focus as much on the little things that can make day to day life stressful. And the reason for that impact actually began on September 10, 2001. That’s the date that, early in the morning, Adventure Guy boarded a plane in Boston and flew to San Francisco. At the time he was working for a telecom company that had its headquarters outside of Boston and its research labs in the Oakland area. He travelled most of the week and was in so many different places, I often didn’t know his exact location from day to day. He was always available by cell phone, so the details didn’t seem so important. But one detail I will remain ever thankful for is the fact that late on the evening of September 10, Adventure Guy called to tell me that he had made it in safely to San Francisco. Otherwise, I would have been absolutely panic-stricken when I realized what was happening the next morning, when the news came out that the terrorists were clearly targeting cross-country flights for the hijackings. That morning, I was in the office preparing to go to a local conference. I stepped into the hall on my way out, and our custodian told me that a plane had just crashed into the World Trade Center. I didn’t initially think of it as an attack, but rather thought it was an accident, perhaps a small plane that was offtrack in the New York airspace. I went next door to the Guidance Office where there was a television and watched the developing events in horror. We were watching as the second plane hit. And every day since then, I’ve tried to remember just how easily our little family here in Suburbia could have lost him. 24 hours made all the difference for us. And each time I read the tributes and the remembrances for those lost that day, I think of their wives and husbands, parents and children who weren’t so lucky. And I am always thankful, truly thankful, not see Adventure Guy there among them. As the hours between three and six this afternoon ticked by, I felt more than a little empty. For the first time since 1998, I did not attend an elementary school “Meet the Teacher” event on this Tuesday before the start of school. With Soccer Boy’s official start of 7th-grade on Thursday, I will be the mother of three secondary school students! Years ago, my mother made an annual pilgrimage to Suburbia just to help me with the start-of-school chaos. The day camp program my kids attended took off the week before school started to do the changeover between summer programs and before/after school programs. Add in the need to complete the registration process and haul school supplies to classrooms across multiple campuses while towing three children along, and I wasn’t too proud to call in reinforcements. My mom, a former elementary school teacher, thought catching a glimpse of her precious grandchildren’s classrooms provided plenty of incentive for braving the August heat each year. If I could tell 2003 LSM–the one standing in line sweating through a perfectly good outfit–that she’d eventually find herself nostalgic about these events, I’m pretty sure she’d laugh out loud, likely with at least a little tinge of hysteria. Fortunately, All-American Public Schools spreads the registration/back-to-school events for middle school and high school across a number of days. DD1 took herself and a pile of signed documents (along, unfortunately, with an equal number of signed checks for various and sundry purchases and fees) to pick up her SENIOR year schedule last Wednesday. Adventure Guy took Soccer Boy to the middle school that afternoon, where they arranged for his first school ID and delivered his supplies to his locker. I checked in for duty on Friday since DD2 appeared less than thrilled about my suggestion that she take care of her registration without me. DD2 likes to remind me that 9th-grade counts as high school. However, I spent last year in full denial of this detail, since freshmen in our district attend a separate “freshman academy.” This year, there’s no way around the fact that I have two children in high school. Two in high school, and one in middle school. Where did the time go? I think I’d be willing to sweat through a few more Meet The Teacher Days if doing so meant slowing things down just a little. Every year as my siblings and I started school, my mother told us she didn’t plan to let us move on to the new grade. I wonder if I can make that technique work any better for me than it did for her? This week, DD1 and I find ourselves testing our admittedly rather limited navigational skills as we visit four of her five potential college picks. Her criteria? Must be a large, state university. Must not bee “too” cold. Must be within reasonable driving distance from Suburbia. Must not be likely to attract large numbers of other students from All-American High. Must have an undergraduate program that lends itself to meeting admission requirements for physical therapy school but doesn’t limit employment opportunities if physical therapy school turns out to be just a passing interest. So far, we’ve visited the University of Arkansas and the University of Missouri. I’m typing from our hotel room now, having sampled some excellent homemade ice cream at a local Lawrence, Kansas spot. Tomorrow, we learn more about the University of Kansas. But we’ve already learned some valuable things on this trip. We travel well together, just the two of us. DD1 can handle herself in unexpected rush-hour traffic (note to self, it would have been better to time arriving in Kansas City some time other than 5:00 p.m.). Maids are not likely to turn in your expensive Chaco sandals that were left under the hotel room bed, even if you realize your mistake a few hours later and call the hotel prior to leaving town. And most importantly, sometimes you just know if a school is a good fit or not. Sometime you just know, and even more importantly you should always listen to that little voice that leads you in the right direction. I’ll keep you posted as to what direction that voice takes DD1 next year. This past week defies description. In addition to non-stop meetings, the agenda included an unexpected funding crisis, a wildfire, and a funeral for good measure. I spoke on Thursday to a parent group whose children would be directly affected by the potential loss of a federal grant that appears to be caught up in Congress’ argument about the deficit. The school district narrowly avoided losing one of the support services buildings to a fire sparked by welders at a neighboring company, and Adventure Guy and I just arrived back in Suburbia following a ten-hour round trip to be with our best man and his family as they said goodbye to his father. Since, with all of the above going on lately, I’ve failed miserably at keeping this site updated, I thought I’d leave you with a few shots we’ve received from DD1’s ongoing trip to China. 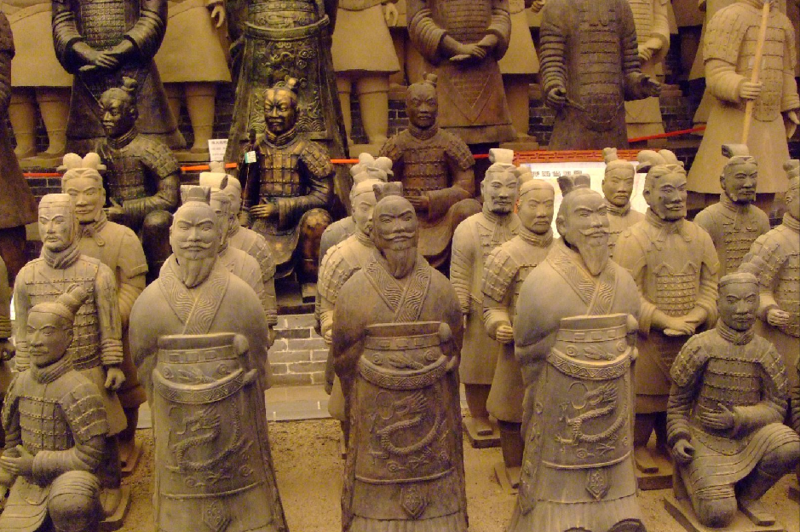 These are from the group’s visit to Xi’An. She seems to be having a wonderful time, and I can’t wait to hear more when she returns home later this month. It seemed appropriate somehow to prepare for DD1’s sendoff to China tomorrow by eating an All-American meal of cheeseburgers and fries. Having spent a month away from home at camp each summer since she was eight, DD1 appears unfazed by the idea of leaving us tomorrow to travel half-way around the world. “It’s only for three weeks!” she said as she packed her bags earlier this week. If any worries cross her mind, they involve food. DD1 may be an adventurous traveller, but she’s not so much an adventurous eater. Her carry on essentials include Luna Bars and PopTarts! Just in case! Here’s the group’s itinerary. Fortunately, the trip falls over Spring Break, so they will not miss as much school as it appears at first glance! 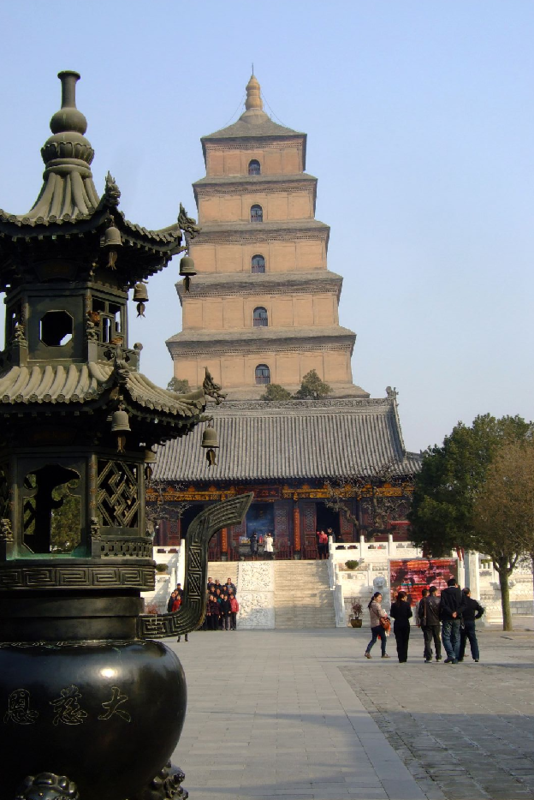 March 5-6—Tour Beijing, including Tiananmen Square, the Forbidden City’s Palace Museum, the Great Wall of China, the Temple of Heaven, and the Hongqiao Pearl Market. March 23—Tour Guilin including a cruise along the Li River and shopping at the local market. March 24—Shopping in Shanghai before travelling by magnetic levitation high speed train to the airport for the return to Suburbia. I have to admit to more than a bit of jealousy when I read about all the exciting things DD1 will experience on this trip! She can’t wait to see her exchange partner who visited us last fall as well as all of the other Chinese students involved in the exchange. I’m hoping that amid all that excitement, she’ll remember to email her mom every once in a while and contribute a few posts to the exchange blog. Knowing teenagers and travel, however, I don’t plan to hold my breath waiting for that. I am also not going to worry. Repeat. I am not going to worry. Maybe if I say it enough times, it will come true! 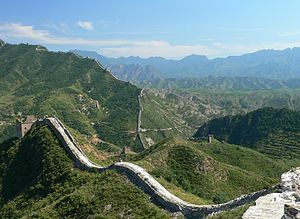 In less than two weeks, DD1, thirteen of her friends, and two All-American High teachers take off for China. The six months since her Chinese partner departed for home seem to have flown by, and I can’t believe it’s time for our group to travel. Our challenge in the next few days: find suitable gifts that travel well and don’t set us back a small fortune. Gifts are big in the Chinese culture. The students and teachers who visit AHS each year continually produce gifts for everyone they come across. While our student lived with us, she not only gave us some beautiful items but also had something on hand for all of the extended family, including grandparents, great-grandparents, aunts and uncles. I’m not sure where she stowed all those items in her one suitcase! Now that DD1 will be meeting many new people in Chengdu, we need to reciprocate–with gifts not made in China! So far, I’ve purchased Vera Bradley jewelry cases, interesting charm necklaces to go in them, and matching coin purses for our exchange student and her mother. While honestly not completely my taste, Vera Bradley items always prove popular with our Chinese guests, and they are not readily available for them. We’ve also decided to send a coffee table book about our city to her host dad. The bigger challenge is what to send for the other miscellaneous gifts. I’m open to any and all suggestions! An innocent enough text started it all. It came in as I met with a group of colleagues about plans for a new school building. Though it’s still awfully snowy out, only the neighborhood roads continue to present a driving challenge. I decided DD1 could handle getting from our house to the entrance without too much difficulty, so I texted back. When her picture popped up on my ringing phone fifteen minutes later, I knew something had gone wrong. With visions of crumpled cars in my head, I took a deep breath and answered the phone. Much to my relief, it was nothing quite so dire. Instead, DD1 found that her car wouldn’t start when she finished at the bank. She’d called her dad, but he wasn’t answering his phone. Fortunately, I could run to her rescue. When I arrived, I succeeded in getting the engine started, and we headed for the car dealership about a mile away with me following behind DD1. I called Adventure Guy on the way to let him know of the car issues. All went well until we had to wait through a very long light just south of the dealership. When the light turned green, DD1’s car refused to move. I hopped out of my car amidst honking horns, tried and failed to get the car started, and got DD1 into my car. I made another, much more desperate, call to Adventure Guy. Voice mail. We headed to the dealership, hoping they would help us get the car out of the intersection. The answer from the “service” representative? “Well, I guess you’ll have to call for a tow.” Since we literally could see the intersection and the disabled car from the dealership, this was definitely the wrong answer. I can’t wait for that feedback form to hit my inbox. I asked DD1 to find the number for roadside assistance as we drove back to the intersection. We parked in a nearby convenience store lot, and then I braved traffic again to put her hood up to alert other drivers of the disabled car. As I trekked back to the parking lot, two men in a plumbing company van asked if they could help me. Yes. Yes I did, you jerk. And, then, Adventure Guy called. He knew nothing of our circumstances since his phone showed no missed calls. He felt terrible but said, “Well, it sounds like you have it all under control.” And I did, with a lot of help from an unexpected source. It’s nice to know there are still people around who are willing to take time out of their day to help someone in need. And I know exactly who to call next time I need any plumbing done. Unfortunately, it also caused All-American Public Schools to break a record of its own–most school days missed in a row due to weather. My children haven’t set foot in a classroom since January 31. The major problem with returning to school late last week and early this week involved the lack of clearing of neighborhood streets. 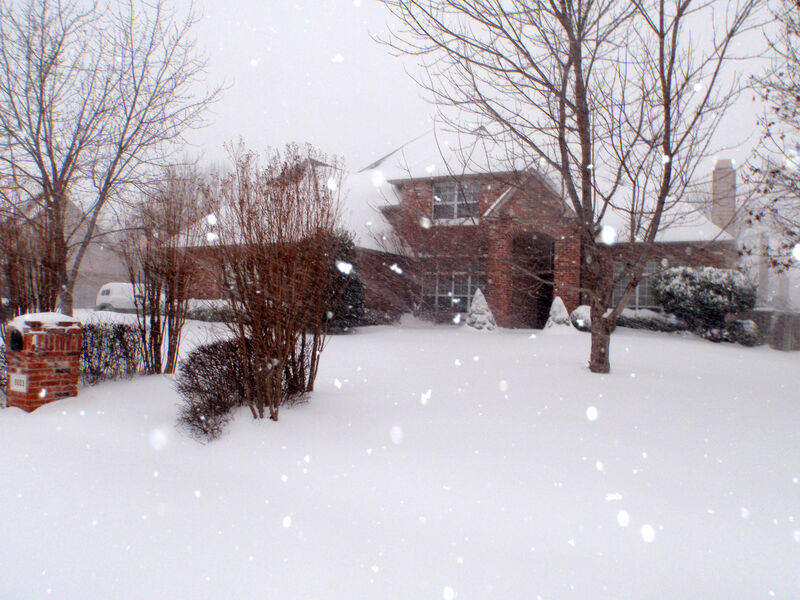 Unless a neighborhood previously contracted with a private group for snow removal, nothing happened. While Adventure Guy and I could brave the streets in our 4-wheel drive vehicles, smaller cars could not. Though we tried several test runs from the district transportation center, school buses couldn’t navigate the rutted streets either. So the kids stayed home. As demonstrated by my lack of posting, I worked both Monday and Tuesday, including a long night at Monday’s evening school board meeting. Much of my time that was not devoted to trying to squeeze in all the meetings and work cancelled during last week’s storm involved working to figure out exactly how we’ll be making up all this time. We developed a plan, just in time to take another day off thanks to the eight plus inches of new snow that fell last night and this morning. The good news? This weekend’s forecast includes temperatures in the 50s. We might just make it out of here before spring after all. College. Seemingly as soon as Adventure Guy and I arrived home with DD1–having driven more carefully those few miles from the hospital than on any other trip in our lives–someone warned ominously, “I hope you’ve started a college fund. Do you know what it’s going to cost by the time she gets ready to go to school?” We’d nod in agreement and go back to thinking about paying for diapers and daycare. Now suddenly, DD1 is halfway through her junior year of high school. She hasn’t needed diapers in years, though it’s amazing how other expenses took their place–swim team, cello lessons, car insurance payments. I understand now how they come up with that six figure estimate of how much it takes to raise a child. And I have three of them! I also, much to my relief, have inlaws who set aside money for our children’s education. That fact alone opens up some options that the kids simply wouldn’t have otherwise, since we fall in that difficult category of making too much to qualify for need-based assistance but not enough to either have set aside a large college fund for each child or to pay college costs entirely out-of-pocket. I firmly believe that it’s a mistake to saddle students with large amounts of college debt just as they begin their adult lives, and I would have a hard time encouraging one of my kids to go to a school that would require taking large loans to complete. With all that said, it should please me that DD1 has narrowed her college search to public universities in states surrounding our own. On her want list for a school: strong science program, mid-size to large student enrollment, college town setting, winters no colder than here in Suburbia, and a location within driving distance from home. So this summer, we’ll make some visits to each of the campuses she’s identified so that she can get a feel for each of them. We’ve also discussed visiting the Boston and Washington, D. C. areas to see some of the alma maters of various relatives. Her grandmother is rooting for Georgetown, her school, while Adventure Guy’s uncle talks up Boston College. But, DD1 shows little enthusiasm for those options. And, it’s not that she couldn’t get in. Her test scores are strong, her extracurricular activities both varied and deep, and she has a distinct advantage in the “geographic diversity” category. None of that is a guarantee, but she hasn’t done anything to rule herself out of consideration for more competitive universities. My question. Is it worth it? Should we push her to apply at some of those schools or be thankful that she wants to stay closer to home and pursue an education that will not leave anyone in debt? In fact, those scores above qualify her for some pretty nice merit-based scholarships at many of the schools on her list. 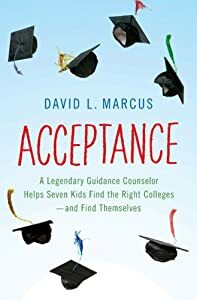 I just finished a great book on this topic–because as Adventure Guy once said if I’m doing something I’ve got to have a book about it–David L. Marcus’ Acceptance: A Legendary Guidance Counselor Find The Right Colleges–And Find Themselves. I added it to my Kindle one day and finished it the next. In between I often found tears running down my cheeks as I read about the students and their individual challenges and triumphs, and I picked up some helpful tips to use when it comes time for DD1 to write those entrance essays. Ultimately, I want her to find the school that fits for her. The challenge is how to make sure she has a full understanding of all the options without hijacking the process. I think it was easier changing those diapers! 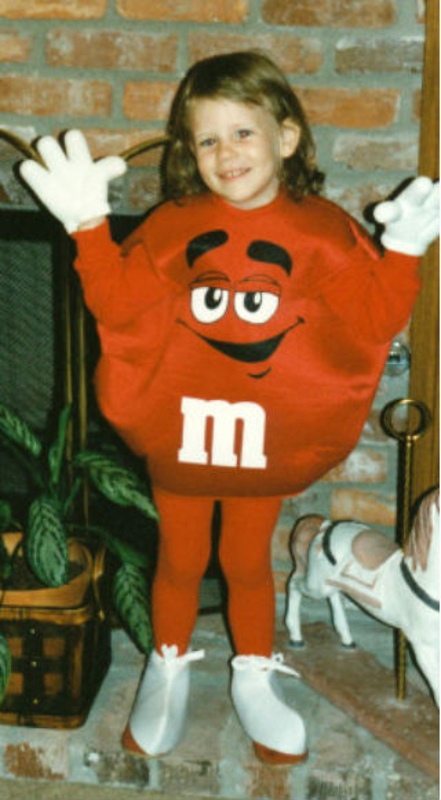 Daily I find myself marveling that the little girl in the picture below now stands taller than I do. This morning, I had just enough time to hug her and wish her happy birthday before she bustled off to school, track practice, and work. Seventeen! I know the song lyric is, “She was just seventeen,” but surely it could be, “I was just seventeen.” That’s certainly the way I feel, though the fact that I continue to receive emails about my upcoming 25th high school reunion obviously proves otherwise. DD1 makes me proud. A child who continually demonstrates wisdom beyond her years, she focuses on living life fully today while still dreaming about tomorrow. I love her tremendously, this girl who launched my journey as a mother, but–even better–I truly like the young woman she’s become.